For the past month, we have been working on the writing challenges presented by our Get NZ Writing package. We waggled our ears, rolled our tongues, licked our elbows and crossed our eyes; we did surveys; we found amazing sounding words; we found incredible facts and we wrote it all down. We learnt about metaphors then wrote about ourselves using metaphors. Now all of our writing is on its way to Boulcott School in Wellington. We hope they love receiving our package as much as we enjoyed creating it. We eagerly await the arrival of a package from them, opening the door to their world. 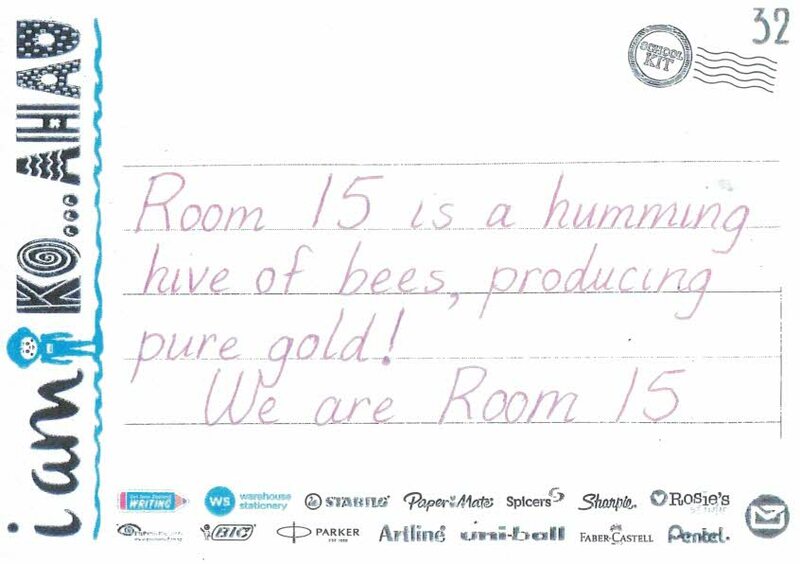 Wow Room 15! What wonderful learning. Lucky Boulcott School being your buddy class. Bet you can't wait to receive your package from them. I remember doing this! Hey wait a minuet! *scans eyes over work* No fair! You did better work than us! Good job! This was so much fun when I did this! The postcards looks very colourful. How long did it take to do everything? Keep up the wonderful work! 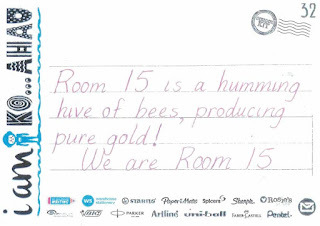 I love your poem about being like bees room 15. 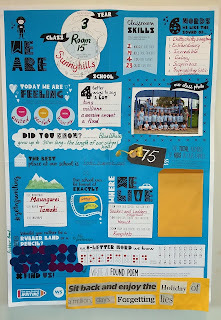 Your postcards for this collaborative poster and writing task looks high quality. You must be proud to share this with other learners in a different school in NZ. I remember when I did this. It was so much fun.